One of my subscribers has a document that contains labels with names on them. The document is intended to be printed using Avery 5162 labels, but she wants to change the document so it uses Avery 5163 labels. She would like to do this without having to recreate her entire document. There are a couple of methods you could use for this problem. It is important, however, to remember that a label document is nothing but a large table that is formatted to match the dimensions of your labels. Understanding this, you could easily examine the table settings used in creating Avery 5163 labels and then change the table settings in your old document to match them. Because you change the table settings to match what is required for the new labels, you should be able to print on them with no problems. Another method is to create a new document consisting of empty Avery 5163 labels and then copy the data from the old Avery 5162 document to the new document. As long as you do not copy the table structure, but just the data, you should not have a problem. If your labels are all the same, then the easiest method of converting to the desired label format is to simply use much of the same process you used to create the labels in the first instance. Open your existing document, that contains your labels in the Avery 5162 format. Press Ctrl+C to copy the selection to the Clipboard. In the Create group, click Labels. 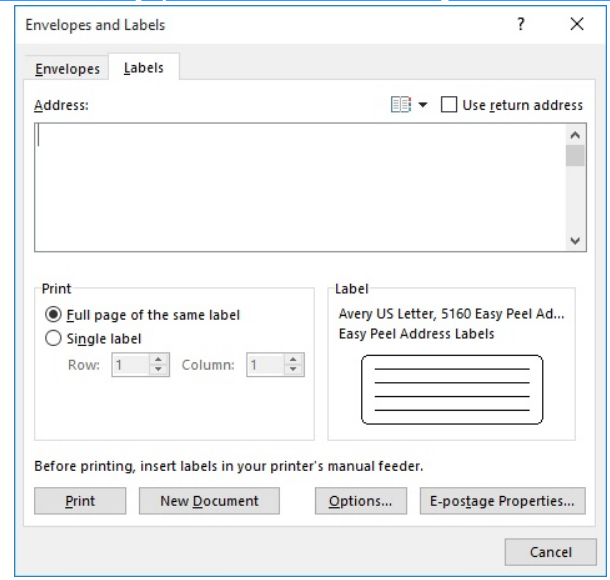 Word will display the Labels tab of the Envelopes and Labels dialog box. Click Options to display the dialog box. Using the Label Vendors drop-down, select Avery US Letter. In the Product Number list, select 5163. Click OK. Word will close the Label Options dialog box. Be certain the Full Page of Same Label is selected. Click New Document. Word will create a new document using the label format you specified in Steps 7 and 8. Press Ctrl+A to select the entire new document. Press Ctrl+V to paste the contents of the Clipboard into your new document.